Ben Affleck and Matt Damon have been buddies since before adolescence, growing up in the same Cambridge neighborhood. They shared an interest in baseball, movies, and girls, and both worked as actors at an early age. Affleck did commercials for Burger King at 8, and he was a regular on a PBS series, The Voyage of the Mimi. At 9 he appeared in his first film, Dark End of the Street, a low-budget no-star drama filmed in Boston and Cambridge. At 14 he was in an after-school special with Madeline Kahn. He auditioned for a small role in Mystic Pizza, but Damon got the part. Damon went on to Harvard, but Affleck didn't have the grades to get in, and went to the University of Vermont instead. He soon dropped out, and eventually came to Hollywood, where he ended up sharing an apartment with Damon. For re-writing and co-starring in Damon's Good Will Hunting later that year, Damon & Affleck shared an Oscar for Best Screenplay. He also appeared with Damon in Glory Daze, Dogma, and Jay and Silent Bob Strike Back, among other films. They also do Project Greenlight together, a reality show wherein some unknown moviemaker gets his script made into a low-budget movie. 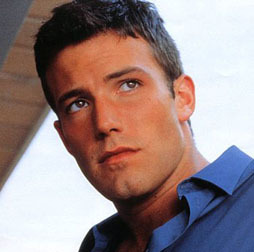 More recently Affleck has found success as a director, and in 2013 he signed to play Batman in the movies. Not raised to any religion. Affleck's father is Protestant, his mother Roman Catholic, and he himself was not baptized into any church, and as an adult does not seem to attend any church.